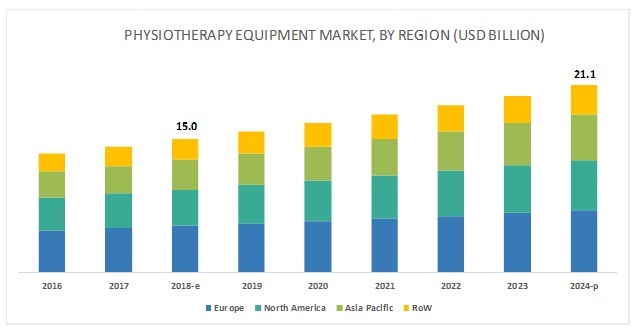 [114 Pages Report] The physiotherapy equipment market is projected to reach USD 21.1 billion by 2024 from USD 15.1 billion in 2018, at a CAGR of 5.8%. The growth of this market is primarily driven by rapidly growing geriatric population and the subsequent increase in the global prevalence of chronic diseases, and growing incidence of sports injuries, degenerative joint disorders, and cerebrovascular disease. By type, the electrotherapy equipment segment is expected to be the faster-growing in the physiotherapy equipment market during the forecast period. The electrotherapy equipment segment is projected to grow at the highest CAGR between 2018 and 2024. Growth in this segment is mainly driven by the increasing adoption of electric stimulation-based techniques for physiotherapy. By application, the musculoskeletal segment is expected to account for the largest market share during the forecast period. On the basis of application, the physiotherapy equipment market is segmented into cardiovascular and pulmonary applications, musculoskeletal applications, neurological applications, pediatric applications, gynecological applications, and other applications (includes sports and palliative care). In 2018, the musculoskeletal applications segment accounted for the largest share of the physiotherapy equipment market, followed by the neurological applications segment. The large share of the musculoskeletal applications segment is attributed to the rising incidence of musculoskeletal disorders, growth in the geriatric population, and the increasing number of accidents. Europe is expected to account for the largest market share during the forecast period. Europe is the major revenue-generating region in the global physiotherapy equipment market. 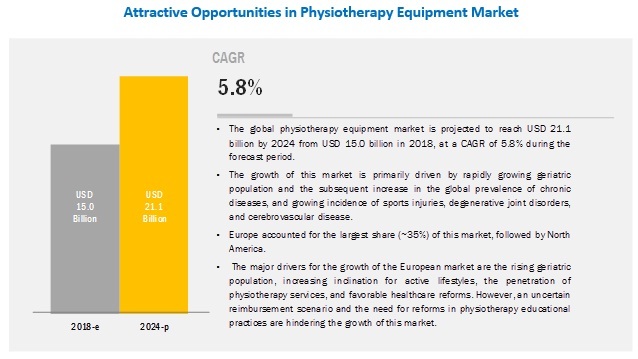 Factors such as the rising geriatric population, increasing inclination for active lifestyles, the penetration of physiotherapy services, and favorable healthcare reforms are driving the growth of the physiotherapy equipment market in Europe. The major physiotherapy equipment vendors include DJO Global (US), Performance Health (US), BTL Industries (US), and EMS Physio (UK). In 2018, DJO entered into a strategic partnership with XPO Logistics, to manage portions of DJO’s North American distribution operations. In 2017, Dynatronics partnered with Orthopedic Outfitters to distribute Dynatronics’ physiotherapy and rehabilitation products. Who are the major market players in the physiotherapy equipment and accessories market? What are the growth trends and the largest revenue-generating region for physiotherapy equipment? How are physiotherapy equipment sold to customers? What are the major types of physiotherapy equipment and accessories? What are the driving, restraining, opportunistic, and challenging factors for this market? * BUSiness Overview, Products Offered, Recent Developments, and MnM View Might Not Be Captured in Case of Unlisted Companies. The study involved major activities in estimating the current market size for the physiotherapy equipment market. Exhaustive secondary research was done to collect information on the market as well as its peer and parent markets. The next step was to validate these findings, assumptions, and sizing with industry experts across the value chain through primary research. Both the top-down and bottom-up approaches were employed to estimate the complete market size. Thereafter, market breakdown and data triangulation were used to estimate the market size of segments and sub-segments. In the secondary research process, various sources such as Bloomberg BusinessWeek, Forbes, and Dun & Bradstreet have been referred to, so as to identify and collect information useful for this technical, market-oriented, and commercial study of the physiotherapy equipment market. These secondary sources included annual reports, press releases & investor presentations of companies, white papers, Centers for Medicare & Medicaid Services, World Confederation for Physical Therapy, American Physical Therapy Association, Chartered Society of Physiotherapy, International Organization for Standardization (ISO), European Physiotherapy Association, and International Journal of Physiotherapy and Rehabilitation. The secondary data was collected and analyzed to arrive at the overall market splits, which were further validated by primary research. The secondary research was used for the following processes, trade directories, and databases. Secondary research was mainly used to obtain key information about the industry’s supply chain, the total pool of key players, market classification, and segmentation, according to the industry trends to the bottom-most level and regional markets. It was also used to obtain information about the key developments from a market-oriented perspective. All possible parameters that affect the market covered in this research study have been accounted for, viewed in extensive detail, verified through primary research, and analyzed to obtain the final quantitative and qualitative data. After deriving the overall physiotherapy equipment market value data from the market size estimation process explained above, the total market value data was split into several segments and subsegments. To complete the overall market engineering process and arrive at the exact statistics for all the segments, data triangulation and market breakdown procedures were employed wherever applicable. The data was triangulated by studying various qualitative & quantitative variables as well as by analyzing regional trends for both the demand and supply side macro-indicators. This research report categorizes the physiotherapy equipment market based on product and application. With the given market data, MarketsandMarkets offers customizations according to company-specific scientific needs.